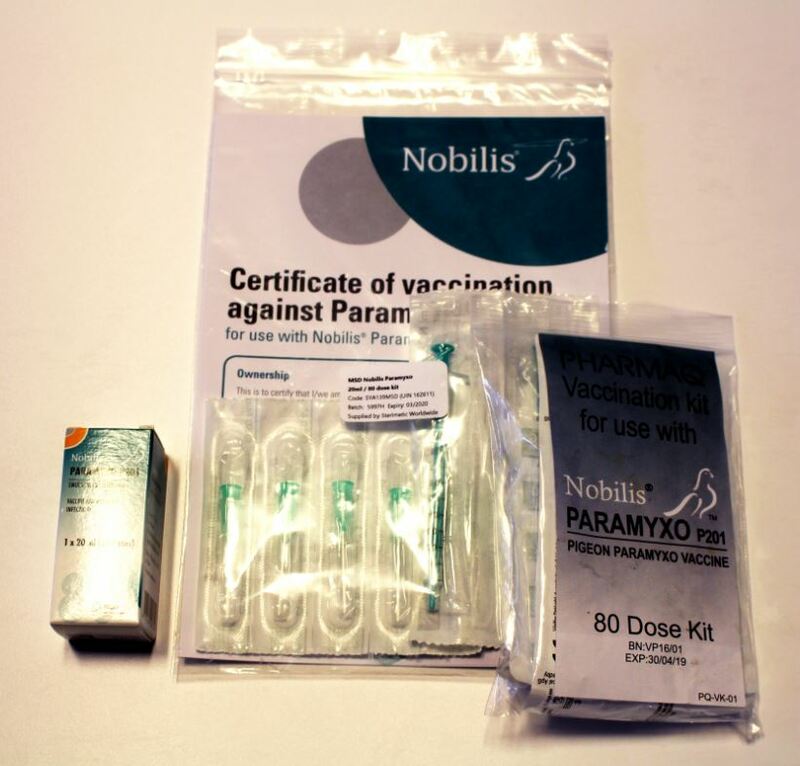 Nobivac (Nobilis) PMV 80 is a vaccine produced to protect pigeons from the effects of paramyxo virus infection. It is given by injection (0.25mls under the skin of the neck). The vaccine can be given from 5 weeks of age and takes about 4 weeks to take full effect. It then lasts for about 1 year, so annual revaccination is recommended. The vaccine should ideally be given 5 or 6 weeks before virus challenge is expected (racing, showing, breeding etc). With each order of Nobivac PMV 80 Pigeon Vaccine you will receive a Nobilis Vaccination Kit which includes 2 x syringes, 4 x needles, vaccination certificates and an instruction guide. Onset of immunity: 4 weeks after primary vaccination. A duration of immunity of 1 year has been demonstrated. Allow the vaccine to reach ambient temperature (15-25°C) before use. Shake well before use. Use sterile syringes and needles. Birds can be vaccinated from five weeks of age. Annual revaccination is recommended. Vaccination within 4 weeks of the start of the breeding season is not recommended. No information is available on the safety of this product during the reproduction period. To the user This product contains mineral oil. Accidental injection/self injection could result in severe pain and swelling, particularly if injected into a joint or finger, and in rare cases could result in the loss of the affected finger if prompt medical attention is not given. If you are accidentally injected with the product, seek prompt medical advice even if only a very small amount is injected and take the package insert with you. If pain persists for more than 12 hours after medical examination, seek medical advice again. To the physician This product contains mineral oil. Even if small amounts have been injected, accidental injection with this product may cause intensive swelling, which may, for example, result in ischaemic necrosis and even the loss of a digit. Expert, PROMPT, surgical attention is required and may necessitate early incision and irrigation of the injected area, especially where there is involvement of a finger pulp or tendon. No information is available on the safety and efficacy of this vaccine when used with any other veterinary medicinal product. A decision to use this vaccine before or after any other veterinary medicinal product therefore needs to be made on a case by case basis. Do not mix with any other veterinary medicinal product. Store in a refrigerator (2 °C to 8 °C). Do not freeze. Below are some recent questions we've received regarding Nobilis Paramyxo Pigeon Vaccine, including answers from our team. What is expiry date on this product. Unfortunately we do not hold this product in stock, so we cannot check the expiry date for you. We find that most items have at least six months use, but this is not guaranteed.